With the sun beating down our house with its Southwestern exposure, it seemed there would not be any time to make dessert for dinner. But the ripe blueberries nesting in the refrigerator, graciously provided by the U.S. Highbush Blueberry Council, were begging to be eaten, and I decided on a cool, frosty treat for dessert. With the kitchen on the top floor, and all the heat rising, I needed to to be in and out before my sneakers had a chance to melt. 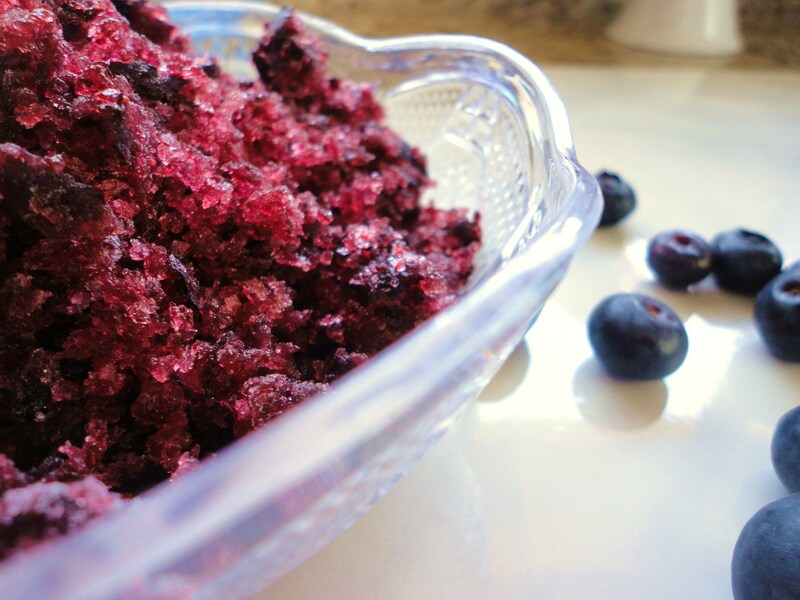 All I needed was a food processor and four ingredients to make a fabulous Blueberry Granita. Sure I had to scrape the purplish ice every so often, but it only takes a minute for each scraping and it meant standing in front of the freezer…the icy cold freezer. We had our fair share after dinner and then had some to help keep us cool the following blazing afternoon. Granitas are like cousins to gelato and sorbet. The texture can vary wildly in Italy from city to city. In Italy, granita may be served at breakfast, with brioche, or at any other time of the day. Many regions of Italy offer specially flavored versions using seasonal fruits or agricultural products unique to the area. I like having nice chunky crystals, though smoother granitas will be just as tasty. In a small sauce pan bring the Stevia and water to boil for 30 seconds over high heat. Slowly add the sugary water to the food processor and pulse a few time until just combined. Pour into a loaf pan and wrap with plastic wrap. Place in the freezer. Check back in 2-3 hours for the first scraping. With a fork, scrape the surface of the granita. Cover and place back in the freezer. 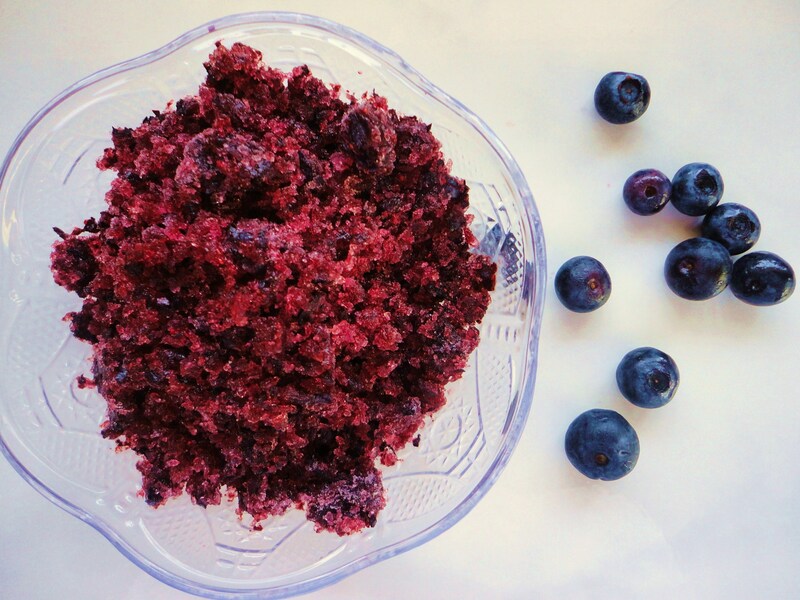 Repeat this every 30 minutes* or so until you have scraped everything in your pan and your blueberry purée is transformed into blueberry ice crystals. *You can skip the repeated scrapping process, and do it all right before serving. The texture of your crystal will just be different and you’ll have to work fast to prevent the whole thing from melting in your hands. My advice is to scrape twice in the hour before service.